The ESPN exodus and once again, it is Fox Sports that is taking advantage. 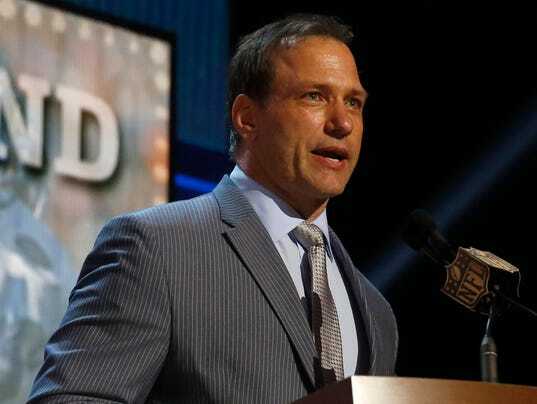 After snaring Skip Bayless for a to-be-determined FS1 program and Robert Smith for their college football coverage, this time they went after the so-called Worldwide Leader's top college football analysts in Chris Spielman. What I find interesting is that Fox is planning on using Spielman on their NFL coverage while also using him as a contributor to their burgeoning college football coverage. To my knowledge, Spielman has never done NFL games before but I don't see why he wouldn't be able to adjust. As to where he slides into the Fox NFL pecking order will be interesting because they didn't have any openings as it's been presumed that last year's guys (minus Tony Siragusa) would return. In my opinion, I don't think he's as good as some others think he is but he did solid work at ESPN and he made for a solid broadcast team with Sean McDonough. He will help Fox's annoncing depth as there is a noticeable drop from Troy Aikman, John Lynch, Daryl Johnston and Charles Davis to guys like Ronde Barber and David Diehl. And it could be possible that his stay on the NFL could be short with Fox gaining rights to Spielman's collegiate conference, the Big Ten, starting in 2017. What this also is is another hit to ESPN's college football coverage as Spielman will join the aforementioned McDonough, who's heading to Monday Night Football, and Brad Nessler, who's unofficially headed to CBS in leading to a shakeup in their announcing crews. It appears that Joe Tessitore will be replacing Nessler on ESPN's second crew, the one that generally calls Saturday Night Football, with Steve Levy replacing McDonough on the lead ABC afternoon crew but as to who he will work with is very much a question mark. I could see somebody like the perennially underrated Ed Cunningham or Brock Huard getting that slot. As we continue to cover and analyze this recent run of talent away from Bristol, it helps to show that not even a behemoth like ESPN is safe the growing cutting of the cord trend or from budget cuts from up above. That would be really neat of Spielman would do NFL games. Skip Bayless, Chris Myers, and Erin Andrews are the only ones that I know of that moved to Fox Sports from ESPN. I don't know anybody else that moved from ESPN to Fox Sports.